Depending on the year, voters may be voting for local officials (selectmen, councilors, mayors, board of education members. etc. ), state officials (state representatives, state senators, the governor, etc. ), or federal officials (congresspeople, the president, etc.). Elected officials are responsible for acting on behalf of their constituents and making decisions based on what their constituents want to see changed. We can tell our elected officials what issues we care about by writing them letters. *Do you know the requirements to be able to vote in the United States? You must be a citizen, 18 years old, and a resident of the state in which you will vote. Constituents are the people that an elected official represents. For example, the Governor’s constituents are the people of Connecticut… and the Kid Governor’s constituents are the kids of Connecticut! An elected official represents all people, even those who are not registered to vote and those who may not be old enough to vote. This includes kids like you. The State of Connecticut Cities and Towns database will help you find your town’s website. On your town’s website you will find the names of your local elected officials and their contact information. The Connecticut Network (CT-N) Legislative Communications Center will help you find your state representatives and state senator and their contact information based on where you live. You can also find information for statewide officials like the governor, lieutenant governor, and secretary of state. My name is [NAME] and I am a 5th grader at [SCHOOL] in [TOWN]. I live at [ADDRESS] in [TOWN]. I am writing you today because I am concerned about [ISSUE]. This is an issue that affects me, my family, and my community because [HOW IT AFFECTS YOU]. I believe that this issue is important because [WHY IT IS IMPORTANT]. I hope that you can help me find a solution to this problem in our community, and I hope that you will consider bringing this issue to our [TOWN COUNCIL/STATE LEGISLATURE/ CONGRESS]. Thank you very much for you attention to this issue. With your help, I believe we can find a solution. We want to know! 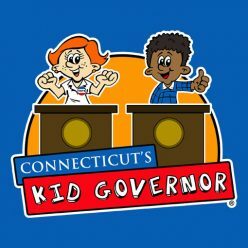 Email 2018 Connecticut’s Kid Governor Megan Kasperowski at CTKGMegan@KidGovernor.org to let her know what issue you care about and what you’re doing to make a difference. Perhaps you will get a shout out in her Stronger Than Cancer blog!